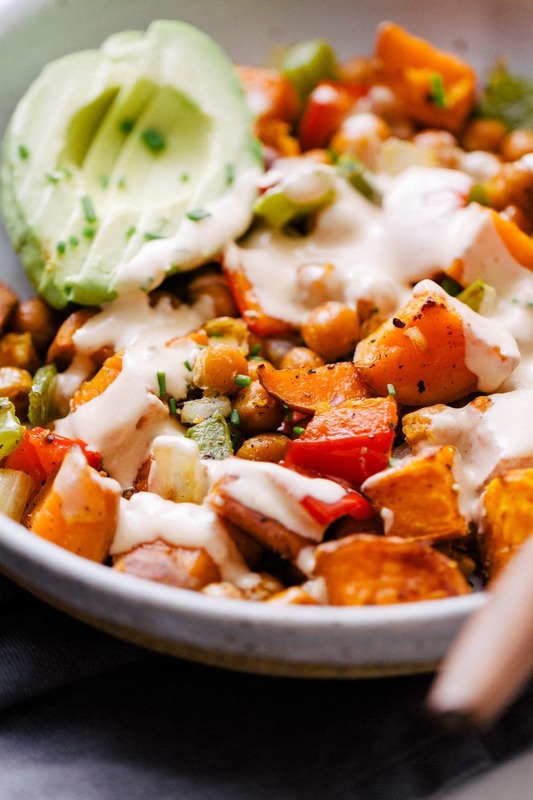 This sweet potato breakfast hash with chickpeas, onions and colorful bell peppers has been my obsession lately. 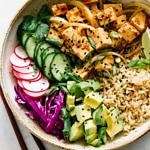 Add to that sliced avocado and a spicy sriracha tahini dressing, and it’s seriously the BEST, and so EASY too! 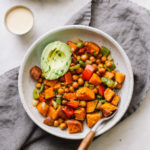 When the weekend arrives, or you have a little extra time in the morning during the week, this chickpea and sweet potato hash recipe is a great way to start the day. 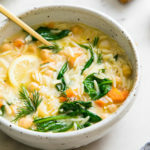 It’s hearty, well-balanced, full of nutrition, and is just plain tasty! You don’t have to keep this sweet potato breakfast hash just for breakfast either, it makes a perfectly acceptable vegan lunch or dinner. So bon appetit my plant-based loving friends! 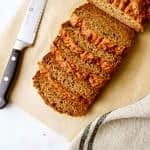 Sweet Potatoes: Sweet potatoes are delicious in this recipe, but feel free to change it up using your favorite potatoes. I’ve also made this potato breakfast hash with gold potatoes, and sometimes I’ll use a combo. Whatever potato you decide to use, you’ll need roughly 1 1/2 pounds, about 3 large will do. Bell Peppers: The combination of the green and red bell peppers are my favorite. You can mix and match various bell pepper colors to suit to your taste, or use what you have on hand. Onion: Use your favorite onion, any will do – yellow, white or red. 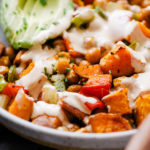 Chickpeas: Chickpeas add a fair amount of protein and fiber to this potato breakfast hash, and of course are delicious! 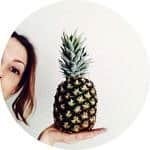 Spices: We’ll be keeping it simple by using just garlic powder, mineral salt and fresh cracked pepper, allowing the flavors of the produce to shine through, even just salt and pepper would do. And if you have garlic flavored olive oil on hand, by all means use it! 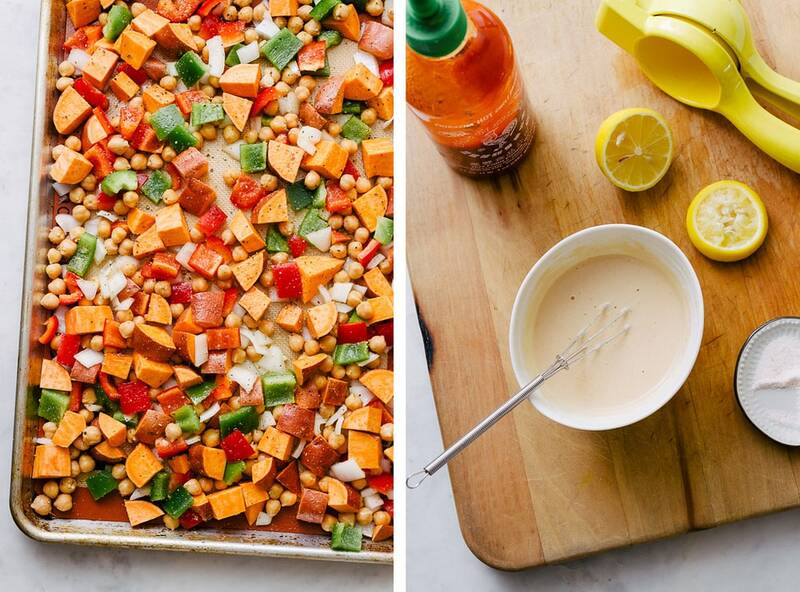 Dressing: The dressing is a creamy mix of tahini, a little lemon juice, pinch of salt and sriracha. It’s super minimal, but taste amazing adding the perfect finishing touch. If you prefer a not so spicy sauce, just the lemon is perfect. You’re going to love how simple this sweet potato breakfast hash is to make! Start by prepping the produce and rinsing the chickpeas. 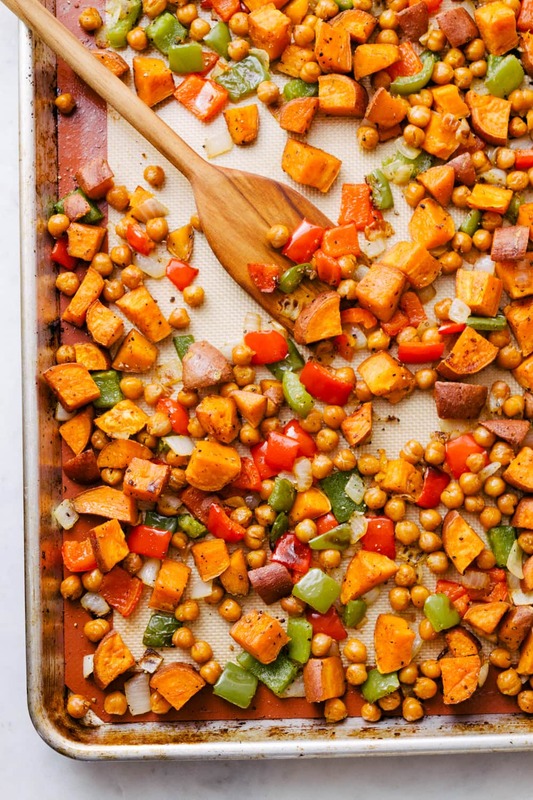 Place the onion, bell peppers, potatoes and chickpeas on a rimmed baking sheet, drizzle with oil, sprinkle with garlic powder, salt and pepper and toss to coat. Spread in a single layer and bake at 425 F. for 20 minutes, stirring halfway through. Turn up the heat to 500 F., give a good stir and cook another 15 – 20 minutes, stir again halfway through. Remove from oven, let cool a few minutes and enjoy! For more breakfast ideas worth getting out of bed for, try these other vegan breakfast-brunch recipes with friends and family, you just may find a new favorite! 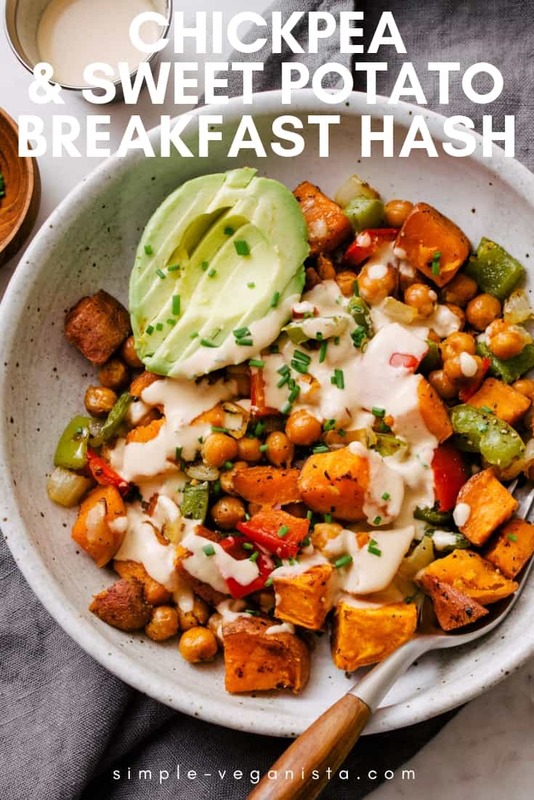 If you try this sweet potato breakfast hash recipe, please let me know! Leave a comment and rate it below. I love to hear what you think, or any changes you make. 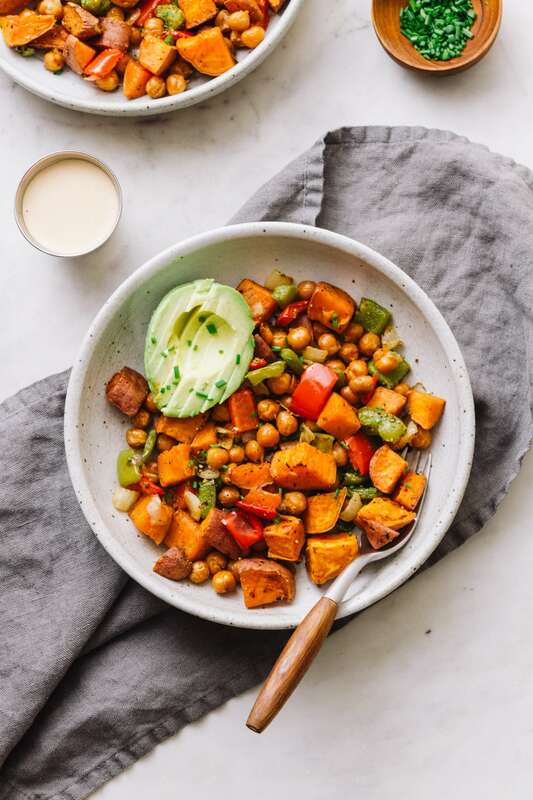 Healthy and nutritious, this chickpea & sweet potato breakfast hash is a great way to start the day! Recipe adapted from Food Network. Preheat oven to 425 degrees F. Line a sheet pan with parchment paper, a silpat, or lightly grease with oil. 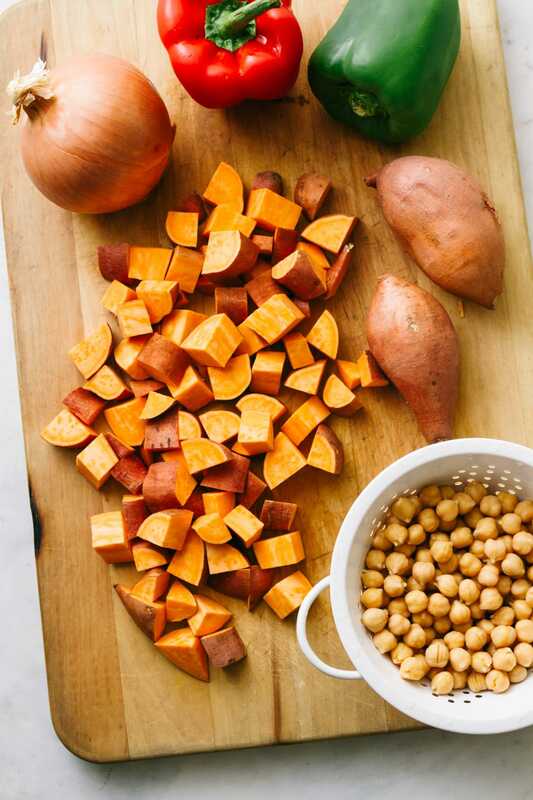 Place the sweet potatoes, onion, bell peppers and chickpeas on the center of the sheet pan, drizzle with olive oil, garlic powder, salt and pepper, toss well to coat. Arrange the sweet potato mixture in a single layer. Place sheet pan in the oven, on the center rack, and cook for 20 minutes, stirring halfway through. Turn heat up to 500 degrees F., stir a second time and continue baking for another 20 minutes, stirring halfway through. Let cool a few minutes and serve with sliced avocado and creamy sriracha tahini sauce.